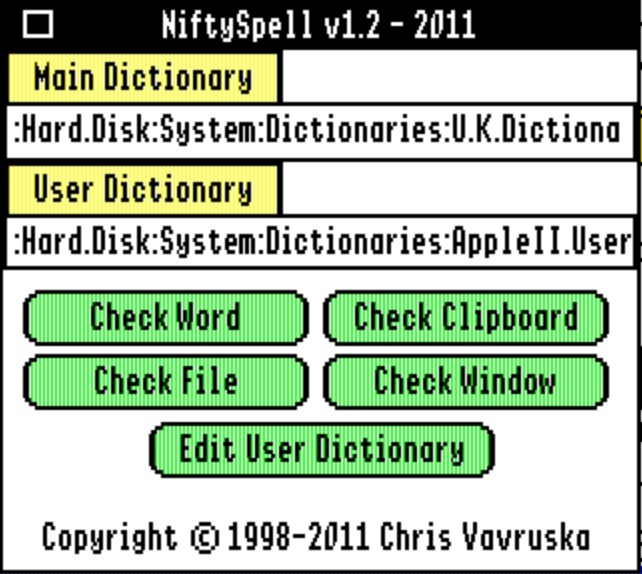 NiftySpell (Freeware Edition), by Chris Vavruska, is a spell checker NDA for the IIGs. It works with any application that uses the TextEdit Tool for word processing. NiftySpell comes with two dictionaries, and full instructions on how to use it. Available either as a .2Mg image, or a BXY file. A Spectrum™ XCMD is included, to allow NiftySpell to be used directly from within Spectrum™. NiftySpell was developed alongside the Spectrum™ XCMD, and Chris has kindly allowed me to now distribute it on his behalf.